Twelve Birds on Tap – Roadtrips in 2018! Freeport Wild Bird Supply and The Maine Brew Bus are excited to collaborate on twelve great outings for 2018 in our popular and growing “Birds on Tap – Roadtrip! series. The unique, relaxed birding and beer-ing adventures that you have come to love combine great local birding at seasonal hotspots with visits to sample the delicious creations of some of our favorite local breweries. These tours are a perfect introduction to birding and/or craft beer, and a great opportunity to travel with significant others, friends, and family that have interest in one topic, while your interest is primarily in the other (for now!). Seasonal birding hotspots and great local beer – a perfect combination, and we’ll even do all of the driving! For 2018, we have added two brand-new tours, and significantly changed several additional itineraries, diversifying our birding and beering opportunities. We’ll visit breweries (and now a couple of cideries and distilleries, too!) from Newcastle to Kittery, and we’ll bird seasonal hotspots throughout southern Maine. Classics such as Spring and Fall editions of “Ducks and Draughts” and “Grassland and Grains” remain unchanged, while tweaks to tours such as “Gulls and Growlers” (now in January), and “Warblers and Wort” (now in Portland!) will make these new favorites even better. And we think the newest additions: “Harlequins and Hops” and “Sod-pipers and Sips” are not to be missed! SATURDAY, January 6th, 2018 – 9:00am-3:30pm. That’s right, we’re taking you on a tour to a landfill! While it might not be our most aesthetically-pleasing destination, the massive concentration of easy food can produce incredible concentrations of birds, especially a variety of gulls, and Bald Eagles. Up to 40 Bald Eagles can be seen here in the winter, and photography opportunities can be outstanding. Meanwhile, among thousands of Herring Gulls, we’ll learn to identify – and yes, appreciate – the variety of species (yup, it’s not just one “Seagull”), starting with Great Black-backed Gull, the largest gull in the world, and visitors from the north: Iceland and Glaucous Gulls. After we’ve had our fill (pardon the pun), we’ll head into downtown Augusta to work the river for more gulls, eagles, and likely Common Mergansers. If it’s an “irruption” year, we might stop at the Viles Arboretum instead to seek out Bohemian Waxwings or Pine Grosbeaks. In addition, if time permits, we’ll seek out some Snowy Owls if they are being seen near our route. Breweries: Sebago Lake Distillery in Gardiner and Flight Deck Brewing in Brunswick. The first new itinerary of 2018 takes advantage of some of the amazing birding opportunities right here in Greater Portland in the depths of winter. We’ll begin on the rocky shores of Cape Elizabeth, where the stunning Harlequin Duck joins a wide array of winter seaducks, from Common Eider to all three species of scoters. We’ll also look for Purple Sandpipers, Black Guillemots, Red-necked and Horned Grebes, Common and Red-throated Loons, and much more. Depending on weather and ice conditions, our second stop may include more seaduck searching, or we might check some of the concentrations of gulls in Portland and and South Portland to look for Iceland and Glaucous Gulls, or perhaps seek out a lingering dabbler among the city park Mallard aggregations. We’ll remain flexible to take advantage – or seek shelter – from whatever winter weather may be at hand. Breweries: Eighteen Twenty Wines and Goodfire Brewing Company in Portland. Breweries: Wiggly Bridge Distillery in York and Dirigo Brewing Co. in Biddeford. Sunday, April 8 – 9:00am to 3:30pm. Breweries: Oxbow Brewing Company and Split Rock Distilling in Newcastle. May means warbler migration, and the new destination for Warblers and Wort will hit two of Maine’s most famous springtime migrant traps, Portland’s Evergreen Cemetery and nearby Capisic Pond Park. Two oases in the urban jungle, featuring water sources and a mix of various habitats, help concentrate migrant birds that found themselves in or over the city come sunrise. After migrating all night, tired travelers looks for refuge: food, water, and shelter, and urban greenspaces are absolutely critical for refueling. While we’re a little early in the month for the largest diversity of warblers, early May could produce incredible numbers of some of the first arrivals, especially Palm and Yellow-rumped. 10-12 species of warblers are certainly possible by this early date, depending on the progression of the season. However, other migrants, such as sparrows, raptors, and other Neotropical Migrants such as orioles and tanagers are also on the move, increasing our chances of seeing a diversity of species. If the cemetery’s apples and cherries are already blooming, we may be in for quite a treat as these are absolute magnets for hungry migrants. It’s sometimes hard to leave Evergreen on a busy spring morning, but if we do, it will be for the very short trip over to Capisic Pond Park, where we’ll continue to seek migrants of all shapes and sizes. Breweries: Sebago Brewing Company in Gorham and Hardshore Distillery in Portland. Sunday, June 3rd – 8:00am to 2:30pm. Breweries: Funky Bow in Lyman and Stone Fort Distilling in Biddeford. Sunday, July 8th – 10:00am to 4:00pm. Breweries: Barreled Souls in Saco and Fore River Brewing in South Portland. Sunday, August 19th – 9:00am to 3:00pm. Our second brand-new tour of 2018 takes us inland to the farms and fields of Fryeburg Harbor. We’ll be a little more specific in our targets for this trip, as we’re heading this way to seek the sought-after group of birds affectionately known as “Grasspipers,” but for both accuracy and alliteration, we’re calling them “sod-pipers.” Our goals include the uncommon American Golden-Plover, but we’re heading to one of the most reliable places in the state for Buff-breasted Sandpiper and Baird’s Sandpiper, two rare-but-regular species that visit us in very small numbers each fall. While Killdeer is probably our only sure bet, other shorebirds are always hoped for, with our focus on the fields and turf farms that are best for Buff-breasted and Baird’s. In the open areas we’ll also look for Sandhill Cranes (a flock usually begins to assemble here by early September), American Pipits, and Horned Larks, while riparian edges could produce some migrant warblers. Raptors are regular as well, including Bald Eagles and American Kestrels. Breweries: Saco River Brewing Co and TBA. Sunday, October 14th – 8:00am to 3:00pm. Breweries: Blue Current Sake Brewery and Tributary Brewing Co. in Kittery. Sunday, November 18th – 9:00am to 3:00pm. Sunday, December 2nd – 9:00am to 3:30pm. So whatever your birding interests are, we have a tour for you! Complete details of each tour and links to trip reports from prior outings, along with information about registration (including easy on-line registration), are available on the Travel, Tours, Workshops, and Events page of our website. And for a little history about how this partnership developed and continues to grow, check out this blog entry from early 2016, as we introduced the first full season on 6 Roadtrips. 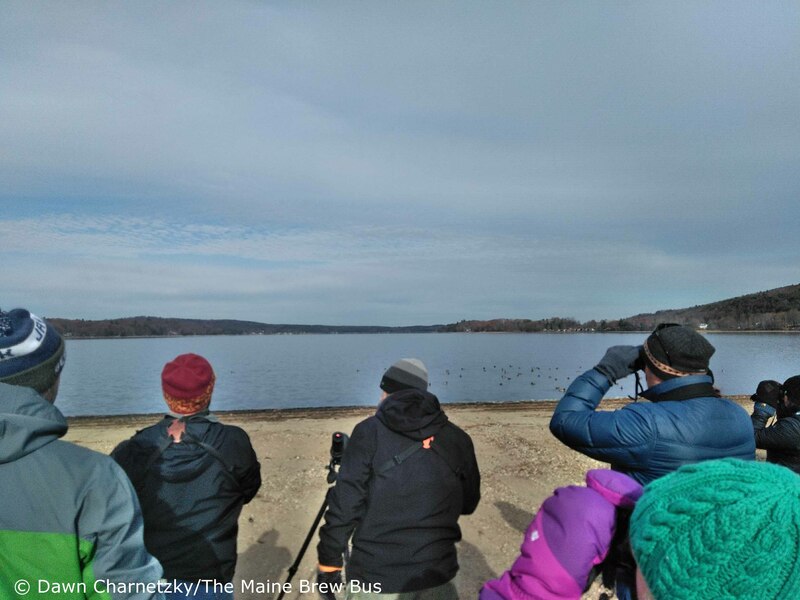 This entry was posted in Birding in Maine, Birds on Tap - Roadtrips, Events, Private Guiding and Tours and tagged "Birds, beer, Birding, Birds on Tap, Birds on Tap - Roadtrip!, Freeport Wild Bird Supply, shorebirds, The Maine Brew Bus, Tours, travel, trips, waterfowl on December 9, 2017 by Derek. Birds on Tap – Roadtrip: Warblers and Wort. Whether from a guide’s perspective or a participant, one of the great benefits of the Birds on Tap – Roadtrip! series of tours with The Maine Brew Bus is that no matter what the weather, no matter what the season, the breweries WILL be there. The same, obviously, cannot always be said for the birds, especially when rain and wind is forecast. Well, they will be there, but whether or not we get to see them is an entirely different thing. And the forecast for Mother’s Day was not good. One of the local forecaster’s simply called it a “complete wash-out.” But rescheduling these events, outside of winter, is a real challenge, and like I said, we can at least guarantee that the breweries will be dry and open! Certainly, the radar, as we departed Portland, did not offer much in the way of optimism. But despite the forecast, the May 14th “Warblers and Wort” Roadtrip was anything but a washout. In fact, half of the birding was done without a drop of rain and even a little filtered sun. But yeah, the first stop was rather damp. We began at the Waterboro Barrens Preserve in Shapleigh, where we enjoyed numerous and conspicuous Eastern Towhees. Several people commented that they had never seen so many towhees, and seen them so well. But with light rainfall falling steadily, the birding was rather slow. We only heard one Prairie Warbler, did not locate a single Field Sparrow, but we were quite pleased to have a singing Red Crossbill fly over. We did get to see a rather rare habitat for Maine – managed Pitch Pine-Scrub Oak barrens – and we compared the forest composition within the reserve to the degraded woods outside the property. We didn’t see all of the denizens of this specialized habitat, but plans were made for return visits on drier days. Female Red Crossbill and a Chipping Sparrow, from a different time and place. Our second stop conveniently took place in the midst of a break in the precipitation. Unfortunately, wet, winding roads slowed down our transit, I spent a few more minutes than I should have at Waterboro, and a little communication error led to us falling well behind schedule. Therefore, we were on a mission as we marched into the Jagolinzer Preserve in Limington. This beautiful little spot, which was one of my favorite discoveries while writing my new book, Birdwatching in Maine: A Site Guide is home to several territories of the localized Louisiana Waterthrush – a bird that today’s group was really hoping to see. As soon as we reached the river, we heard one singing, and then, in my favorite viewing spot, got one to immediately pop out of cover and provide unusually long and unimpeded views as he was clearly challenging the bird singing across the river. Meanwhile, a rather confiding Veery competed for our attention. We would have worked harder for more of the breeding warblers here – this was “Warblers and Wort” afterall – but we celebrated our Louie success – the primary “target” of this visit. The mixed woodlands here, and the deciduous-dominated riparian corridor on the banks of the Saco River were in marked contrast to the rather homogeneous pine barrens. A larger sample of the birdlife would show some significant differences in resultant avian species composition. If “Louisiana Waterthrush Habitat” was listed in the dictionary, this picture would be it definition. All too soon Andy, our driver and beer guide for the day, had to crack the whip and get us on our way. Back in the bus, we shed layers, and Andy took over on the microphone as we weaved our way back around Sawyer Mountain and over to Limerick’s Gneiss Brewing Company, fueled by our kale and feta hand pies for lunch. Not only had they opened just for us, they fired up the woodstove, and we rapidly dried out the remnants of that rain in Waterboro. Concentrating on classic German styles, we learned about Gneiss’s brewing philosophy and operation. Having produced 400 barrels last year, plans are in the works for future expansion and canning. We glimpsed a Wild Turkey strutting through the backyard as we toured the facility and sampled four of their beers. Beginning with their flagship Gneiss Weiss, a full-bodied wheat beer with low bitterness and a subtle hint of banana, we moved on to Sonnenschein, a crisp and well-balanced Kolsch. I really liked this beer; crisp, clean, and easy-drinking but with really good balance and flavor. Next up was Obsius, a stout brewed with roasted wheat and fermented with their house hefeweizen yeast, making for a subtle banana note to go along with the traditional roasty and nutty stout flavors. Last but not least, we were offered a sample of any one of their ten beers on tap at the moment, and on recommendation, I sampled Pyroclast, a collaboration with Orono Brewing Company. Starting with a potent golden ale, it was aged for 13 months in various barrels, including those of both red and white wines, with several rounds of various wild yeasts. The result was an ultra-complex brew with lots of fruity and tart flavors. And, with the Brettanomyces, just a little bit of funk. The second brewery on today’s itinerary was the production facility of Sebago Brewing Company in Gorham. It was fascinating to compare the size of the facility and equipment, and learning how craft beer is scaled up to accommodate growing demand. Ahead of the curve, opening their first brewpub way back (in the world of modern craft brewing, downright ancient) in 1998, Sebago now operates four brewpubs, and supplies cans and bottles around New England. A generous helping of seven samples of a wide range of their offerings helped guide us through the tour and the discussion, starting with Yellow on Friday, their Czech Pilsner. Light in body, crisp, and mellow, this was a rare lager from Sebago. Next up was the Red X, a pale ale recipe using red malt. This one-time brew was surprising – the palette is expecting a sweet amber from the color, but this is an illusion – it was light and dry like a typical pale. It was definitely unique, and I quite liked it. A single hopped pale ale featuring a new New Zealand hop variety offered some tangerine and bitter blood orange flavor, before we relaxed with a new stand-by, the light and refreshing session, Simmer Down. One of their new top-sellers, this was already the fourth release this year of what will likely be a new summer go-to, featuring lots of tropical fruit notes and low alcohol. Sebago’s number one seller is their Frye’s Leap IPA, which may be up to 60% of what they produce in a month these days. Citrus and a touch of pine are featured in this classic IPA. Next up was one of my favorites from Sebago, the Whistlepunk DIPA, which has lots of citrus and other hop flavors, and although it’s a goodly 8% is not boozy to me. We then finished up with their Hop Yard Porter, with local hops, and a fairly light body for a porter. Needless to say, we had all fully warmed up by now! The short trip to Portland and then on to Freeport, discussion revolved around the wide variety of beers that were sampled, and for many, life birds – especially the Louisiana Waterthrush – that were spotted. And the fact that it wasn’t even raining for the whole day; that is most definitely a win! This entry was posted in Birding in Maine, Birds on Tap - Roadtrips and tagged "Birds, beer, Birding, Birds on Tap - Roadtrip!, Eastern Towhee, Freeport Wild Bird Supply, Gneiss Brewing Company, Gorham, Jagolinzer Preserve, Limerick, Limington, Louisiana Waterthrush, Red Crossbill, Sebago Brewing Company, The Maine Brew Bus, Tours, trips, Veery, Waterboro on May 21, 2017 by Derek.